A young baby Canada Goose Gosling sits and rests at the Marsh Boardwalk in Point Pelee National Park in Leamington Ontario. These baby Geese look nothing like a fully grown Canada Goose, but they do grow up to become the large well known Canadian Goose. Young Canadian Geese, called goslings, look very much like ducklings when they are first born as they are yellow and gray and have a dark bill. However after only one week these birds will get more gray in their feathers and become almost awkward looking. After about nine to ten weeks, they have grown their feathers that allow them to fly and they look like a smaller version of a fully grown adult. 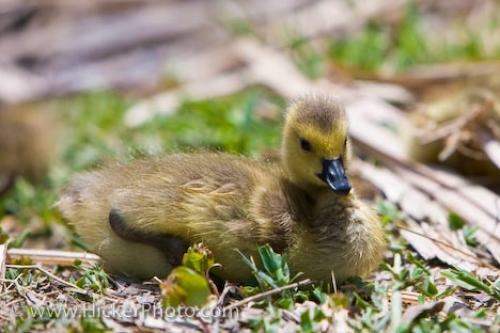 Photo of a Canadian Goose gosling at the Marsh Boardwalk in Point Pelee National Park, Leamington, Ontario, Canada. ... They leave a large amount of waste behind that can pollute both the park area and the bodies of water. When a female goose lays eggs they usually lay about 5 to 7 eggs and the male guards the nesting area. Each egg takes just over a day to lay, so the whole nesting process can take some time. They then take about a month to incubate before the baby goslings start to hatch. Canada Goose, Branta canadensis, gosling at the Marsh Boardwalk in Point Pelee National Park, Leamington, Ontario, Canada. I photographed this photo with the digital SLR camera model Canon EOS-1Ds Mark III, aperture of f/4.0, exposure time of 1/320 sec. on ISO 100, as always I used a original Canon Lens, the focus lenght for this picture was 200mm.